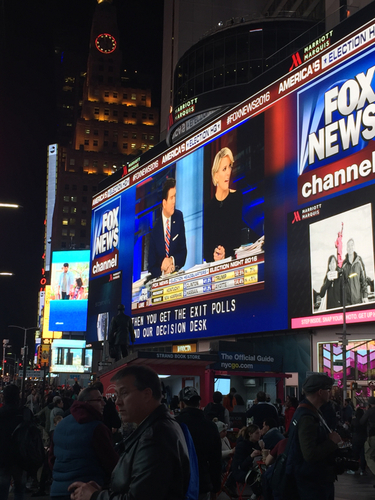 Fox News coverage has come up on the big screen in Times Square as people from all over the world gather to watch the results pour in. I've met and chatted with people from the Netherlands, Scotland, and of course from around the U.S.: Mississippi, Kansas, Texas. There have, of course, also been people from across Canada (you can tell them apart because of the poppy). 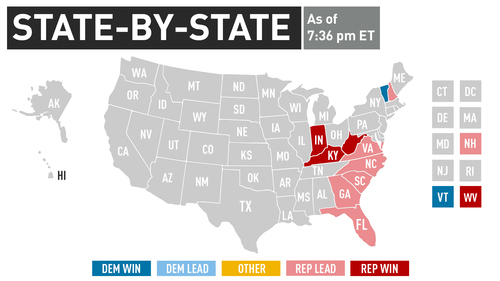 Here are the state by state results thus far. 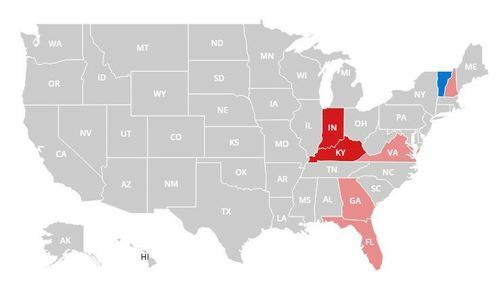 CBC News is projecting Trump will win Indiana and Kentucky and Clinton will win Vermont. 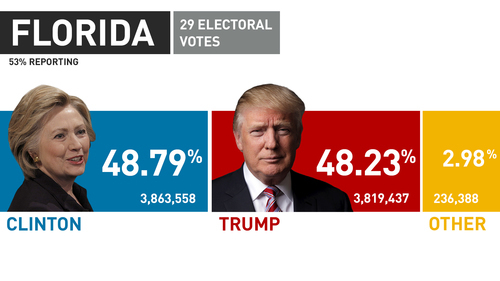 Trump is leading in New Hampshire, Virginia, Florida and Georgia. Keep in mind, it is still very early on. Vast divides of race, gender and education are keeping the presidential race in two tightly fought southern states close shortly after polls close. In both Virginia and Georgia, about nine in 10 black voters and two-thirds of Hispanics backed Clinton, while most whites backed Trump. That's according to exit polls conducted by Edison Research for national media outlets. In Georgia, large majorities of whites with and without college degrees backed Trump. In Virginia those two groups diverged. Whites without a college degree backed Trump by a large margin, while those with a degree split their votes between the two major-party candidates. Women in both states were far more likely than men to back Clinton. Majorities of women in both states said Trump's treatment of women bothers them a lot. 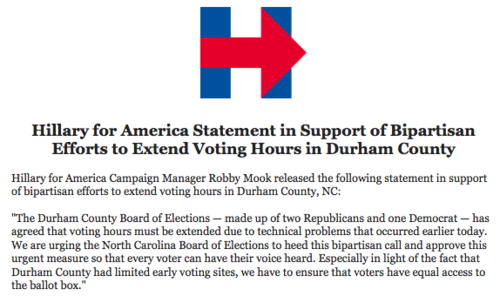 Earlier, Clinton's campaign manager Ruby Mook sent out this notice, requesting extended voting hours in North Carolina due to technical issues in some precincts in the counties of Durham and Columbus. North Carolina, with its 15 electoral votes, has emerged as one of the most important states of the 2016 election. It's practically a must-win for Trump in order for him to continue having a shot in this race. 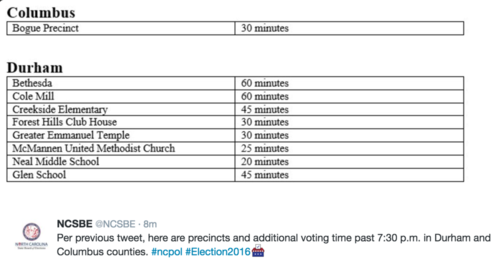 According to the North Carolina State Board of Elections Twitter account, there will be extended hours. 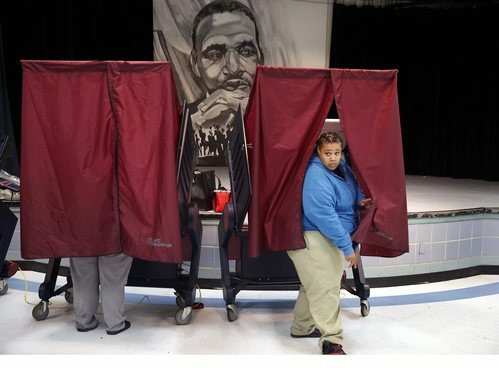 Some precincts were to close polls at 7:30 p.m. Here are the updated extended hours beyond 7:30 p.m.
With the early results coming in, Florida continues to flip-flop between Trump and Clinton. 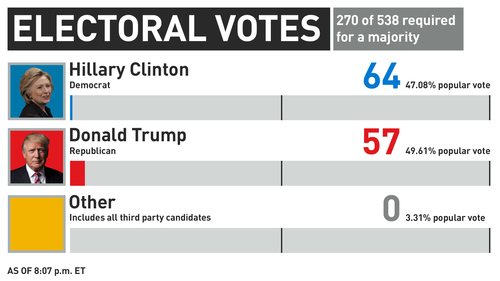 Clinton is leading at the moment, but it is close: she has 48.93 per cent of the popular vote to Trump's 48.28 per cent. Other has 2.80 per cent. Only three per cent of precincts are reporting. Florida has long been an important swing state. It is the biggest of them, with 29 electoral votes. This was the closest state in the 2012 Obama and Romney race, where Obama won 50 per cent of the vote to Romney's 49 per cent. Trump has many ties to Florida. He owns a home and some resorts/spas there. Okay, this might be a little bit shaky but here's a look at how crowded it is on the media riser at Clinton headquarters. We have a small space between a CBS crew and a BBC Persian crew. That's producer Cheryl on the floor (with Twizzlers!!) and cameraman Jason behind the camera. Everytime someone tries to pass it's like being in a movie theatre. A very early lead for Donald Trump. CBC NewsMajorities in the U.S. Senate and House of Representatives were up for grabs in Tuesday's election, with Democrats clinging to hopes of capturing the Senate and Republicans expected to retain House control. Philadelphia District Attorney Seth Williams says he has found no evidence of fraud or intimidation at the city's polls despite Republican candidate Donald Trump's warnings about voter fraud. Williams says no major problems have emerged among the 68 complaints his office investigated during the first half of election day. Meantime, several Pennsylvania counties are reporting a handful of complaints about touchscreen machines switching votes. They say the machines are quickly being re-calibrated to fix the problem. Pennsylvania Secretary of State Pedro Cortes says the Republican Party reported problems with about 25 machines, out of nearly 24,000 deployed statewide. He says in all cases votes ended up being recorded correctly. State Republican chairman Rob Gleason says he doesn't see anything "nefarious" in the apparent vote switching on older machines. Chris Cox from Bikers for Trump is one of the guests at Donald Trump headquarters. Cox predicts nine out of ten bikers will vote for the Republican nominee. His top concern in this election is "the influx of radical Islam taking over this country." He’s hoping for a Trump landslide but says if he loses, "life goes on". 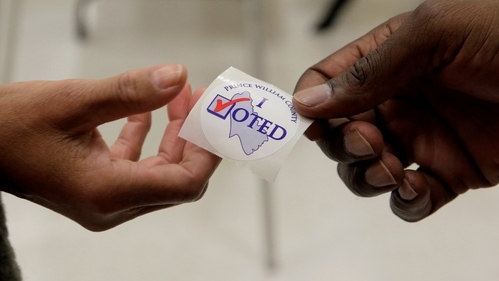 North Carolina got more attention than usual this election, and exit polls show why. Exit polls conducted by Edison Research for national media outlets suggest a tight finish between Democrat Hillary Clinton and Republican Donald Trump for the state's 15 electoral votes. The polls suggest a majority of men back Trump, while Clinton won a majority among women -- with the margins essentially even. The polls suggest women made up slightly more of the electorate. About four out of five nonwhite voters backed Clinton, while about six out of 10 white voters supported Trump. But the exit polls don't offer definitive information about actual turnout among those groups, with the estimates again pointing to a close finish. 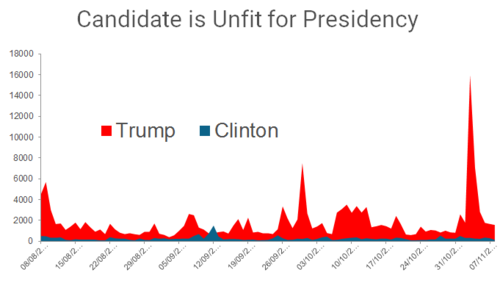 We analyzed Twitter to find moments when users said that the candidates were "unfit to be president." We mapped those statements to issues occurring that same day to find the worst moments online for both candidates. 2. Sept. 8, 2016: Donald Trump suggests the Supreme Court issues could be solved by "second amendment people"
Sept. 11, 2016: Clinton’s bout with pneumonia leads to her near collapse during a 9/11 memorial service. Sept. 9, 2016: Clinton calls half of Trump’s supporters "A basket of deplorables"
It is important to note that when you compare how many people were saying that either candidate was unfit, that the count isn’t even close: more than 90 per cent of commenters on Twitter said Trump is unfit. Here’s what that looks like over the past three months. 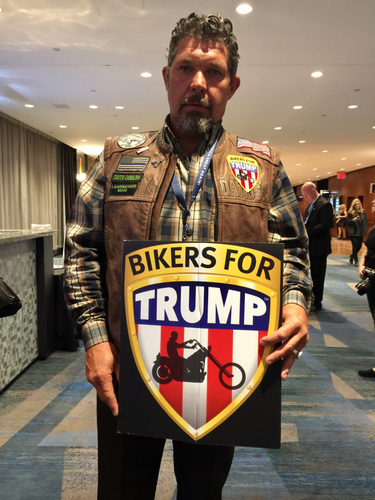 I see my friend Tom Parry at CBC Radio has just posted a pic of a Biker For Trump here at Trump headquarters. 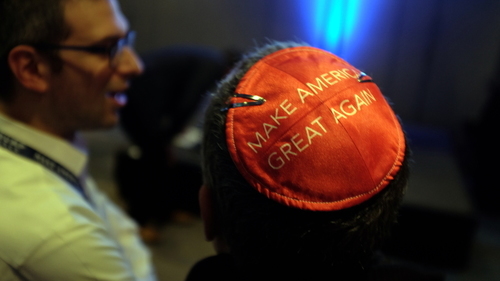 What better excuse for me to post a link to a doc we did on Trump's bikers - and others - who support DJT, from a few months back. In the doc, CBC cameraman Jason Burles daringly hopped onboard a chopper and went for ride to get some of the shots in this piece. Watch for 8 p.m. That’s a crucial time, because it’s when key battleground states of Florida, Pennsylvania and New Hampshire will close their polls. 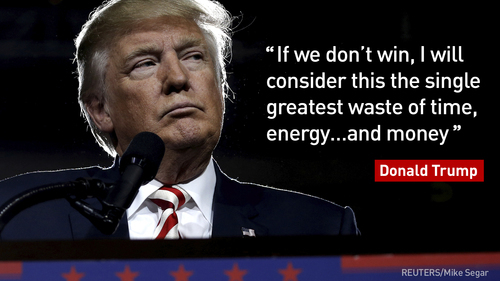 Trump himself has said he can’t see a path to victory for himself without Florida. Look up. Up there. See that blue and red at the top of your screen? We are measuring the race to 270 at the top of this blog. 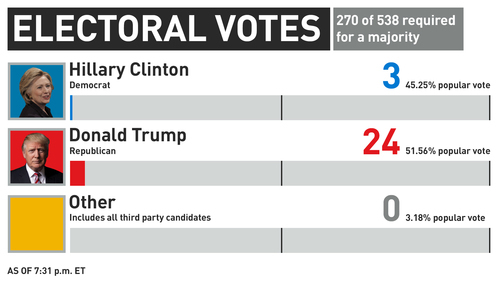 Trump leads thus far with 24 electoral votes to Clinton's 3. 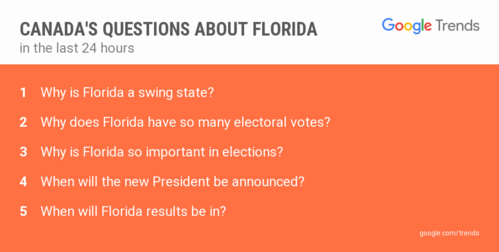 Lots of Canadians are searching about Florida, a crucial swing state. 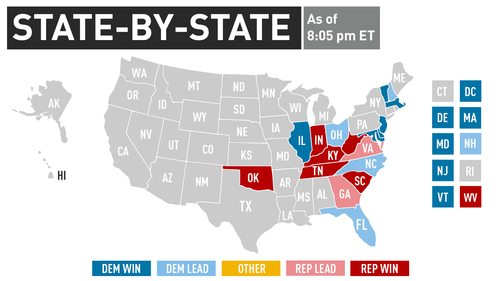 It is leaning towards Clinton at the moment. Here are some things Canadians are searching about Florida from Google's Alex Hunnings. Students walked out of two Phoenix-area high schools this afternoon to protest Donald Trump and a controversial Phoenix sheriff accused of discriminatory policies against Latinos. Some of the students marched to attend a rally, others went door-to-door to encourage people to vote. According to media reports, more than 90 per cent of the students at both schools are racial minorities and mostly Latino. Sheriff Joe Arpaio became known as 'America's toughest sheriff' after instituting immigration sweeps in Latino neighbourhoods several years ago. He became a celebrity in conservative circles, and a pariah in the Latino community. One federal investigator called it the most egregious case of racial profiling in the U.S. A federal judge ordered him to stop the practice, but he ignored the order and now faces criminal contempt charges. 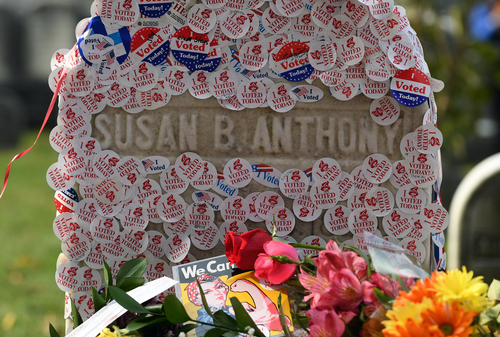 “Him being charged has impacted and contributed to the increase in the number of Latino voters that have registered and participated in the early vote,” says Arizona State University political scientist Thom Reilly. Defeating Arpaio has been a popular rallying cause for Latino activists and organizers. And many non-Latinos in Phoenix turned on the sheriff after the cost of his legal cases balloon to more than $70 million. Arpaio's re-election has proved to be a national proxy war; Arpaio raised more than $12 million, mostly from out-of-state, and billionaire George Soros poured close to $2 million into efforts to defeat the sheriff. The 84-year-old has served six terms, but, according to the latest polls heading into this election, looks unlikely to serve a seventh. 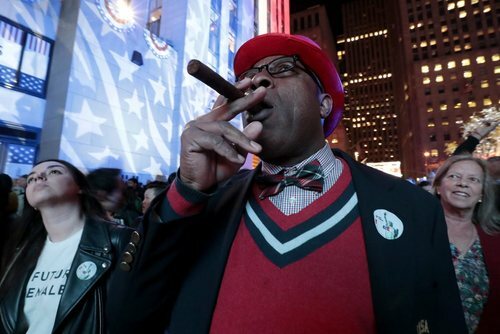 Results should be trickling in from Pennsylvania shortly, which closed at 8 p.m. ET. 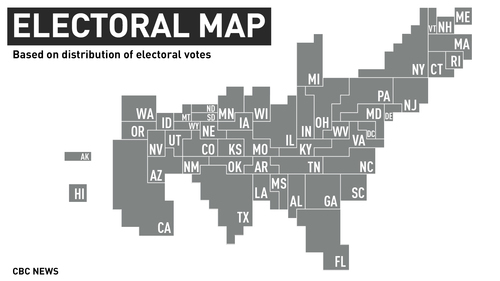 It is home to 20 electoral votes. The state voted for Obama in both 2008 and 2012. They haven't voted Republican since 1988, for George H.W. Bush. The Trump campaign has been targeting female suburban votes there. Proof? Melania Trump gave a speech in a Philadelphia suburb last week. Why Might Clinton Win Florida? 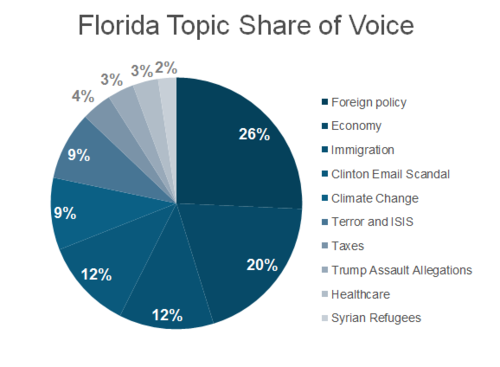 When we look at what Floridians have been discussing online over the past seven days, we see a few topics bubble to the top. Outside of Clinton’s email scandal, voters are talking about things that are favourable to Clinton’s campaign, like climate change and Trump assault allegations. Related to this, when Hurricane Matthew hit Florida earlier this fall, we saw a sizable spike in local conversations about climate change. It seems as if voters have not forgotten. Rudy Fernandez worked for President George W. Bush, but voted Democrat this time. Good news for Marco Rubio fans. The Florida senator has been reelected. He ran (and lost) against Trump in the primaries. The CBC's Adrienne Arsenault is live outside the White House taking your questions on Facebook Live. Have any questions for her? Join the conversation in the comments section on Facebook. An update on that shooting we told you about earlier near a polling station in Azusa, Calif.
One person has been killed and three others have been wounded. There is no indication the shooting was election-related but the polling station in question was locked down as a precaution.